'Teddy boys rock up for farewell to Wolf, 61' - Article written by Joanna Wardill in the Yorkshire Evening Post, 12th December 2013. 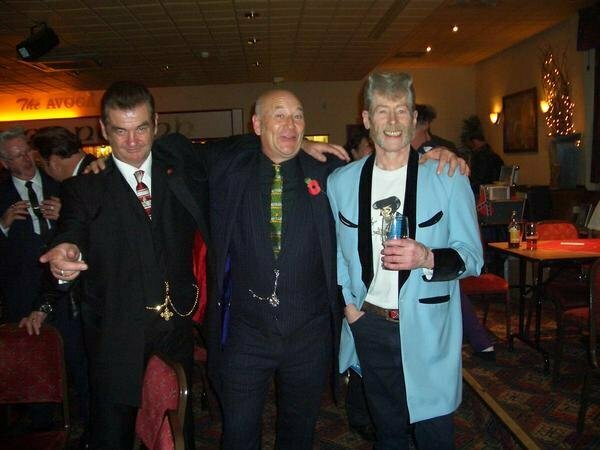 Legendary Leeds Teddy Boy Paul 'Wolf' Exley died peacefully of Emphysema at St James's Hospital, Leeds on Saturday 23rd November and was cremated at Lawnswood Crematorium on Thursday 12th December 2013. This is an article that appeared in the Yorkshire Evening Post following Wolf's Funeral. Probably the last photo of WOLF taken 6 months ago, when Teddy Boy & Rocker, Tony Francis was able to get him out of the house for an hour and drive him round to a garden centre. Rest in peace our good friend. Hundreds of Teddy Boys - decked out in their iconic colourful drape jackets and crepe-soled shoes - gathered in Leeds to give a fitting send-off to a popular local character. The funeral for local Teddy Boy, Paul Exley, 61 - known to most as Wolf - took place at Lawnswood Crematorium before a wake at the Anglers WMC in Burmantofts. Before he died, after a long illness, he requested guests at his funeral wear bright colours - and they duly obliged. Close friend Nick Kovrlija was one of the four pallbearers who all wore light blue drape jackets, which was Wolf's signature look. 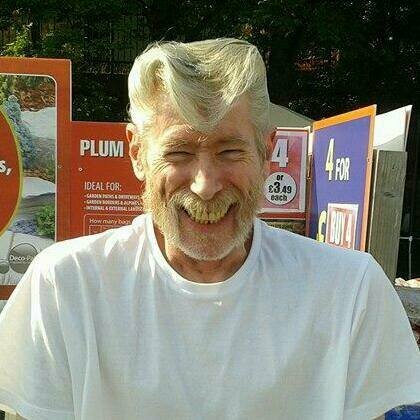 Nick, 65, who has been a Teddy Boy since 1967, said: "We'll miss him a hell of a lot. He was a great lad. He was just a wild character who was loved by everyone." He recalled meeting Wolf for the first time in the former Whip Pub in Leeds, off Duncan Street. "He introduced himself as Paul and knew my name already. We were talking and he started laughing - howling like a wolf. That's why we called him that. He's always been called it since then. Everyone called him Wolf - even when we went down to London." Nick said they started as Teds in Leeds, then went to Dewsbury, Huddersfield and York and then beyond. They now go to meet-ups all over the country most weekends - and many of the Teds they have grown close to were at Wolf's funeral yesterday. Nick explained their love of the Teddy Boy movement: "It's the rock and roll music, the friends, when we all get together we have fun. We're all getting older but we're still enjoying what we do. We can't dance as good as we used to, but we still have great times out every weekend, if we can." Another friend, Paul Halmonroyd, 61, who was also a pallbearer, said he met Wolf in Leeds pubs listening to rock and roll. He said: "It first started in the 1950s, with rock and roll. We just grew up with it - and are still going with it. It's part of our past. It's like our religion. It was a teen thing and we have just grown up with it." Nick said Wolf was an "exceptionally fantastic" man - shown by the 160 who turned up to bid him farewell. "We expected a few to turn up, everyone who knew him turned up. He would have loved that." He added: "We did have some fun. He's still in our hearts and we will still see him when we close our eyes. He will always be here with us." Happier times at the Leeds Irish Centre in 2010 with Nidge, Melbourne and Wolf. Yorkshire Evening Post 'Wolf' Video of Funeral on Thursday 13th December 2013.